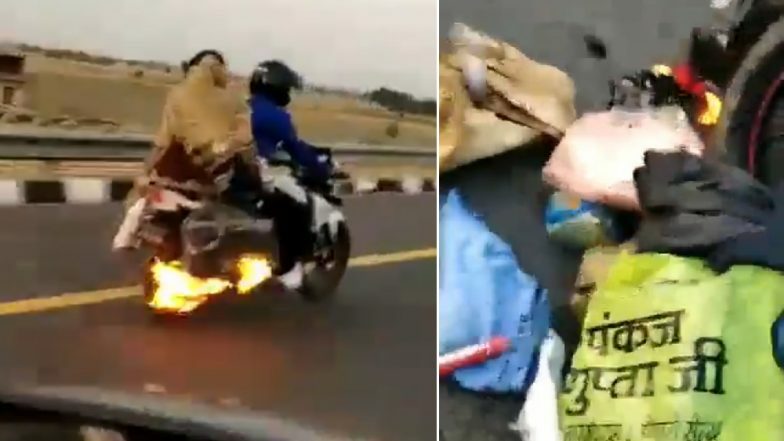 Lucknow, April 16: A biker speeding on the Lucknow-Agra Expressway was saved in the nick of time by the UP Police which noticed that his luggage had caught fire but the driver and his family were clueless about it, officials said Monday. The PCR team chased the biker for four kilometers, stopped it and helped the biker in dousing the flames. The presence of mind and effort put in to save the man, a woman and her infant baby, from a certain accident earned the team commendation from DGP O P Singh, Inspector General Kanpur range Alok Kumar Singh and also cash reward of Rs 2,000 for each member of the team. UP Police Twitter Handle Uses Sacred Games Meme To Give Warnings Against Fake News. The PCR UP100 team was on regular patrol duty on the expressway towards Agra when the bike with luggage on fire zoomed past it, they said. Sensing danger to the rider and family which was pillion riding, the van swung into motion and chased him for nearly four kilometres asking him to stop, the officials said. On stopping, the biker realised the fire was about to spread to the petrol pipe, they said. Viral TikTok Videos Help Police Nab Gangsters in Delhi; Youth Carrying Pistols and Dancing to Honey Singh Songs Arrested. The police team comprising officers Vikram Singh, Amit Baisla and Om Singh helped the biker in dousing the flames, they said. A video of the entire incident was posted on Twitter by UP100 where people lauded the alertness of the patrol team.